In the administrative web portal, you can use the Organization navigation menu to create and manage organizations and suborganizations for each of your clients. Each separate organization and suborganization can be configured with different settings and policies, so that you can provide a customized solution for each of your clients, while still managing everything from one centralized location. This multitenant solution allows for a scalable environment that can grow and change according to your needs. For more information, please reference the Making the Most of Multitenancy Knowledgebase article, and the Managing Inherited Policies in Suborganizations Knowledgebase article. You can create organizations and suborganizations for each of your customers. You can also create an organization for internal use. In the Organization navigation menu, select the organization under which you want to create the new organization. For example, if you want to create a new organization under the master organization, select the master organization. The selected organization displays. Click the Create Organization button in the Organization navigation menu. The Create an Organization page displays, allowing you to configure general settings and policies. For more information, please reference the sections below. To update an existing organization, navigate to the appropriate organization and click the Settings tab. The Organization Settings page displays, showing the General tab. In the Parent Organization drop-down menu, select the name of the higher-level organization that you want to act as the parent organization. For example, if you want to move the organization under the master organization, select the name of your master organization. In the Organization Name field, enter a descriptive title for the organization. Select the Trial Mode checkbox if the organization is currently acting as a trial for a customer. Trials expire after a specified number of days. In the Trial Until field, select the date on which the trial should expire for the customer, if applicable. If you select a date in the past, the trial to expire immediately, and lock out users. In the Hostname field, enter a unique URL that will be used when linking to the organization. Links to resources and shares will be prepended with this hostname (for example, customer.syncedtool.com). In the Organization Slug area, you can view the full URL of the organization. This value cannot be edited after you create an organization. In the Description field, provide a description of the organization that can be used to organize and identify the organization. In the Contact Email field, enter the email address that will be used as the main contact for the organization. In the Default Timezone drop-down menu, select the preferred timezone for the organization, which affects dates and times displayed across the system. Leave this field blank to use the default timezone for the system. When creating or editing an organization, you have the option of defining custom policy settings. Policies control the way in which an organization manages data, users, files and folders, API tokens, bandwidth, and other features. Through policies settings, you have full control over the way in which your users work within the system. To update an existing organization, navigate to the appropriate organization and click the Settings tab, and then click the Policies tab. The Organization Policies section displays. In the Space Quota field, set the space limit for the organization. Space quota limit values must be greater than 0 and less than 10000000. Best Practice: Ensure that this limit is enough to account for personal files and folders, Team Shares, backups, deleted files and folders, revisions, and so forth. The sync process will stop if this limit is reached. Additionally, you might consider configuring an alert so that you are notified when the organization is reaching its set limit. For more information, please reference the Managing the Activity Log and Creating Alerts Knowledgebase article. 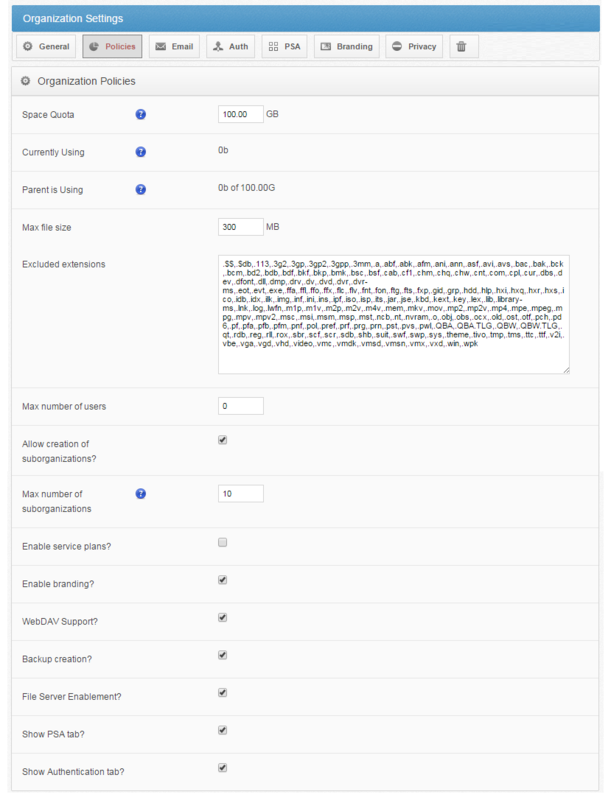 In the Parent is Using area, view the amount of space used by the parent organization, if applicable. In the Max File Size field, set the maximum size of individual files that can be uploaded by end users through desktop client, mobile apps, and web uploads for users and guests. By default, this limit is set to 300MB. For more information, please reference the Maximum Size of Individual Files Knowledge Base article. In the Excluded Extensions field, enter file extensions that you want added to the list of default excluded extensions, making sure that each extension is separated by a comma. Files with excluded extensions cannot be synced by the system. If an excluded extension is upload through the web portal, end users will receive an error messaging notifying them that their file is on the exclusion list. In the Max Number of Users field, enter a user limit that will be allowed for the organization. Alternatively, enter 0, which represents an unlimited number of users. Suborganizations cannot exceed the maximum number of users set for the parent organization. Select the Allow Creation of Suborganizations checkbox to allow child organizations to be created under the organization. A suborganization will inherit this policy from its parent. In the Max Number of Suborganizations field, set the maximum number of child organizations allowed under the higher-level organization. Alternatively, leave the field blank to allow an unlimited number of suborganizations. A suborganization will inherit this policy from its parent. Select the Enable Service Plans checkbox to allow the creation of service plans. A suborganization will inherit this policy from its parent. Select the Enable Branding checkbox to allow custom styles and logos for the organization. A suborganization will inherit this policy from its parent. Select the WebDAV Support checkbox to support WebDAV connections, which is another way for end users to view and edit files—both personal and through Team Shares—located in the cloud. WebDAV is useful when you do not want local copies of large files being stored on external machines. Select the Backup Creation checkbox to allow administrators to create backups from the administrative web portal. A suborganization will inherit this policy from its parent. Select the File Server Enablement checkbox to allow machines to be cloud-enabled. With File Server Enablement, you can keep the existing file structure on the server while allowing remote access to files and folders. To configure File Server Enablement, please reference the How to Cloud-Enable a Server Knowledge Base article. A suborganization will inherit this policy from its parent. Select the Show PSA Tab checkbox to give access to the PSA tab in the administrative web portal, which is located under the Settings tab. In the PSA tab, professional services automated systems—such as ConnectWise and Autotask—can be integrated with Anchor. A suborganization will inherit this policy from its parent. Select the Show Authentication Tab checkbox to give access to the Authentication tab in the administrative web portal, which is located under the Settings tab. In the Authentication tab, authentication sources can be configured for the organization. A suborganization will inherit this policy from its parent. Select the Let Organization Admins Browse User Files checkbox to allow organization administrators to view data in files, folders, shares, and backups, which is required to restore end user files. A suborganization will inherit this policy from its parent. Select the Let Organization Admins Browse Remote Files checkbox to allow organization administrators to browse machines. Browsing machines is required when setting up backups or File Server Enablement. A suborganization will inherit this policy from its parent. Select the Let Organization Admins Create Users checkbox to allow organization administrators to generate new user accounts in the system. A suborganization will inherit this policy from its parent. Select the Allow Users to Create Their Own Backups checkbox to allow end users to configure backups from the web portal or from their local machine. A suborganization will inherit this policy from its parent. Select the Allow Users to Share Files checkbox to allow end users to send shares. A suborganization will inherit this policy from its parent. Select the Force New Share Links to Require Login checkbox to disable public shares, and require the use of secure shares for all members of the organization on all devices. This policy also applies to shared items sent through the Outlook add-in. Secure shares require a username and a password before the content can be accessed. If a secure share is sent to someone outside of the user's organization, a guest account will automatically be created for the recipient. This policy is only available if the Allow Users to Share Files policy is enabled. A suborganization will inherit this policy from its parent. Select the Enable Web Preview checkbox to enable the Web Preview tool for end users. This feature allows users to preview content in the web portal. Select the Enable Web Editing checkbox to turn on the Collaborative Web Editor tool for end users. This feature allows users to edit content directly in the web portal. Select the Allow Users to Overwrite Collisions checkbox to allow end users to resolve collisions by syncing their own local copy as the latest server version. Select the Allow Users to Lock Files checkbox to allow users to lock and unlock files. If this policy is enabled at the master organization level, the policy will appear for each organization. Otherwise, this policy is set per organization. The Use Filesystem Permissions to Enforce Locks On field allows you to specify extensions on which you would like the desktop client to enforce locks through filesystem permissions (also called hard locks). 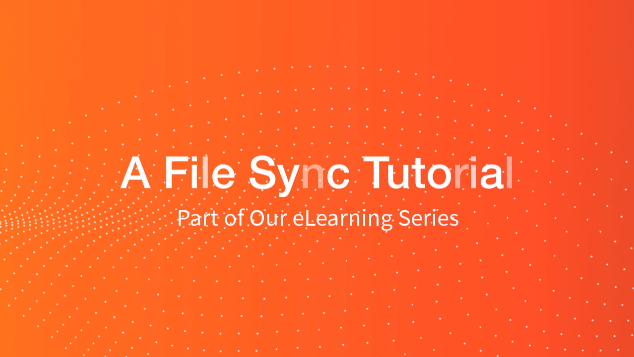 This field is important for File Server Enablement environments where mapped drive users must be notified by the filesystem when a file is in use. When a lock is placed, the desktop client will change the NTFS permissions on Windows, or HFS Plus permissions on Mac, in order to prevent changes by other users. These permission still allow administrators to modify files, but they prevent standard end users from doing so, and makes for a much stronger lock. This field can only be edited if you previously selected the Allow Users to Lock Files checkbox. In the Force Password Change After field, enter the number of days that end users can keep their passwords. End users with expired passwords will be required to change their passwords when logging into the web portal. Select the Require Two-Step Authentication checkbox to add an extra layer of security to user accounts. With Two-Step Authentication, end users will be sent a authentication code through a mobile authenticator app, text message, or email; they must then enter their authentication code, along with their username and password, before they can access the web portal or register a device. They will also be required to set up a passcode for any of their registered mobile devices. End users must configure their own authentication settings. In the API Token Settings section, use the Deactivate API Tokens After field to enter the number of hours that an API token should be set as active. By default, API tokens expire after 30 days. In these instances, API tokens will expire immediately after they are used, allowing desktop clients to securely connect to the web portal without requiring a username and password. API tokens for other sessions, including mobile and Outlook connections, will expire according to your API policy settings. Select the Throttle Bandwidth checkbox to help regulate traffic and minimize bandwidth congestion. Restricting bandwidth will mitigate the impact that large files and shares might have on business-critical applications. You can also restrict bandwidth on individual machines. For more information, please reference the Configuring Bandwidth Throttling Settings Knowledgebase article. Select the Enable Throttle Exception checkbox to configure times when bandwidth throttling is not enabled. If you select this option, you will be prompted to specify a time period during which exceptions will be scheduled.